Well my birthday celebration did not stop on the KL trip. On the 27th of January, Best woke up early to cook spaghetti for me. Hahaha... I think it was his first time to cook such food and it was for me! Thanks Best! I prepared fried chicken for them and we also had french fries. It was a simple celebration and we all enjoyed the food. 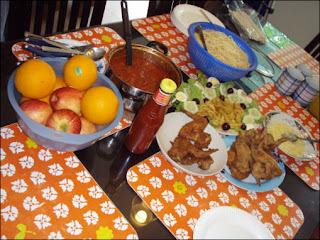 Present that day were Kuya Sam, April, Best and the transient residents in our house namely Ate Cherry with her two kids and their auntie. They shared their lunch and it was a sinigang. We made some tawanans and kuwentuhans. 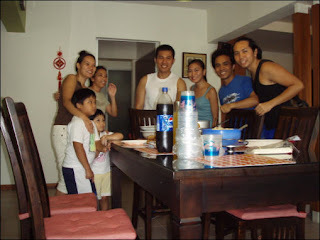 They were my family here that time. I just enjoyed the day and it was a happy moment for me. 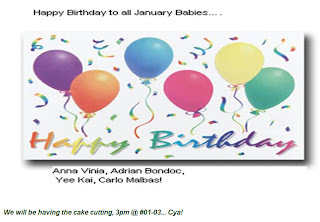 On the 30th of January, our HR officer sent us email informing us that there will be a cake cutting for January birthday celebrants. Hehehe... I wasn't telling my officemates that I celebrated my birthday last Chinese New Year. In short, nabuko ako. But on the other hand, the cake was quite nice and a good way to spend merienda time with all the employees in our company.